Fried Chicken, Sweet Tea, Barbecue, Catfish, and Grits— are all some examples of true Southern culinary icons. Which brings me to two of my favorite words “comfort” and “food.” Put them together and it’s magic, just like the simple blend of cheese, mayonnaise and sweet peppers known across the South as pimento cheese. Like most Southerners, I grew up with pimento cheese spread — from the processed stuff sold in supermarkets to the wonderful, chunky and flavorful varieties made at home. The popularity of this unique spread remains largely confined to the states below the Mason-Dixon line, where it assumes its place as a Southern delicacy. 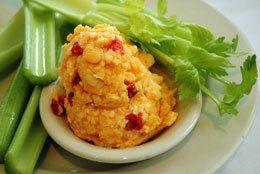 But you don’t have to travel down South to enjoy some authentic pimento cheese. Its basic ingredients are readily available everywhere, and it’s a cinch to make. With it only taking 15 minutes or less to make, why not whip up a batch today? 1. Using a hand held mixer, beat cream cheese until soft. 2. Add the remaining ingredients and beat until creamy and combined. 4. Serve as a dip or as a sandwich filling. 1. Mix ingredients together and store in an airtight container for up to 6 months. Posted on August 23, 2012, in Lady Fab Cooks and tagged appetizer, cream cheese, extra sharp cheddar cheese, food, mayonnaise, monterrey jack cheese, pimentos, Porter House Seasoning, recipe, red wine vinegar, snack, the porter house grille, vegetarian, white cheddar cheese. Bookmark the permalink. 6 Comments. Let me know if you will be interested in submitting this article for the theme magazine BBOOKS. Hello BBooks! I personally want to “Thank You” for this opportunity to showcase one of my many loves and works of art. I am so honored! Congratulations!! your article has been published. You had me at “Congratulations” … Yay Me! Thanks for the opportunity again.